All statistics correct as of 16 April 2019. 1 Sponsored name, referring to 7DAYS. The 2018–19 EuroCup Basketball season, also known as 7DAYS EuroCup for sponsorship reasons, is the 17th season of Europe's secondary level professional club basketball tournament, organised by Euroleague Basketball. It is the 11th season since it was renamed from the ULEB Cup to the EuroCup, and the third season under the title sponsorship name of 7DAYS. A total of 24 teams participate in the 2018–19 EuroCup Basketball. The table below shows the default access list. ^ ABA League (ABA): Crvena zvezda mts, Cedevita, Mornar and Partizan NIS qualified through the ABA League. ^ Spain (ESP): MoraBanc Andorra is a club based in Andorra (which does not qualify for European competitions), but participate in European competitions through one of the berths for Spain (any coefficient points they earn count toward Spain). 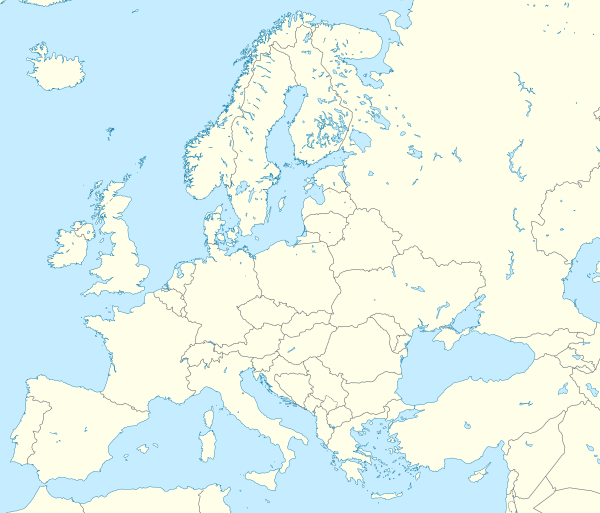 ^ France (FRA): Monaco are a club based in Monaco (which does not qualify for European competitions), but participated in European competitions through one of the berths for France (any coefficient points they earn count toward France). The draw was held on 5 July 2018 at the Mediapro Auditorium in Barcelona. The 24 teams were drawn into four groups of six, with the restriction that teams from the same country could not be drawn against each other. For this purpose, Adriatic League worked as only one country. For the draw, the teams were seeded into six pots, in accordance with the Club Ranking, based on their performance in European competitions during a three-year period and the lowest possible position that any club from that league can occupy in the draw is calculated by adding the results of the worst performing team from each league. ^† Indicates teams with points applying the minimum for the league they play. Note: Positions for scheduling do not use the seeding pots, e.g., Team 1 is not necessarily the team from Pot 1 in the draw. There were scheduling restrictions: for example, teams from the same city in general are not scheduled to play at home on the same round (to avoid them playing at home on the same day or on consecutive days, due to logistics and crowd control). Location of teams of the 2018–19 EuroCup regular season. In each group, teams played against each other home-and-away in a round-robin format. The group winners, runners-up, third-placed teams and fourth-placed teams advanced to the Top 16, while the fifth-placed teams and sixth-placed teams were eliminated. The rounds were 2–3 October, 9–10 October, 16–17 October, 23–24 October, 30–31 October, 6–7 November, 13–14 November, 20–21 November, 11–12 December, and 18–19 December 2018. Rules for classification: All points scored in extra period(s) were not counted in the standings, nor for any tie-break situation. In each group, teams played against each other home-and-away in a round-robin format. The group winners and runners-up advanced to the Playoffs, while the third-placed teams and fourth-placed teams were eliminated. The rounds were 2–3 January, 8–9 January, 15–16 January, 22–23 January, 29–30 January, and 5–6 February 2019. In the playoffs, teams play against each other must win two games to win the series. Thus, if one team wins two games before all three games have been played, the game that remains is omitted. The team that finished in the higher Top 16 place will play the first and the third (if it is necessary) legs of the series at home. The playoffs involves the eight teams which qualified as winners and runners-up of each of the four groups in the Top 16. ^ a b c "EuroCup Board meets in Istanbul ahead of 7DAYS EuroCup Finals Game 2". Euroleague Basketball. 13 April 2018. Retrieved 13 April 2018. ^ "EuroCup Board looks ahead to the 2018-19 season". Euroleague Basketball. 14 June 2018. Retrieved 14 June 2018. ^ "ECA Board reviews commercial strategy, approves 2018-19 competitions team list". Euroleague Basketball. 19 June 2018. Retrieved 19 June 2018. ^ "Euroleague Basketball and ULEB agree on 2018-19 EuroCup calendar". Euroleague Basketball. 1 June 2018. Retrieved 1 July 2018. ^ a b c d e "7DAYS EuroCup draw set to take place on July 5". EuroCup Basketball. 3 June 2018. Retrieved 3 July 2018. ^ "2018-19 7DAYS EuroCup MVP: Luke Sikma, ALBA Berlin". EuroCup Basketball. 5 April 2019. Retrieved 5 April 2019. ^ "Will Thomas named EuroCup Finals MVP". EuroCup Basketball. 16 April 2019. Retrieved 16 April 2019. ^ "2018-19 All-7DAYS EuroCup First Team". EuroCup Basketball. 3 April 2019. Retrieved 5 April 2019. ^ "2018-19 All-EuroCup Second Team". EuroCup Basketball. 4 April 2019. Retrieved 5 April 2019. ^ "Coach of the Year: Aito Garcia Reneses, ALBA Berlin". EuroCup Basketball. 2 April 2019. Retrieved 5 April 2019. ^ "Rising Star Trophy winner: Martynas Echodas, Rytas Vilnius". EuroCup Basketball. 1 April 2019. Retrieved 5 April 2019. ^ "Regular Season MVP: Pierria Henry, UNICS Kazan". EuroCup Basketball. 24 December 2018. Retrieved 25 December 2018. ^ "7DAYS EuroCup Top 16 MVP: Bojan Dubljevic, Valencia". EuroCup Basketball. 16 March 2019. Retrieved 11 February 2019. ^ "Quarterfinals MVP: Peyton Siva, ALBA Berlin". EuroCup Basketball. 15 March 2019. Retrieved 16 March 2019. ^ "Semifinals MVP: Peyton Siva, ALBA Berlin". EuroCup Basketball. 25 March 2019. Retrieved 28 March 2019. ^ "7DAYS EuroCup Round 1 MVP: Maurice Ndour, UNICS Kazan". EuroCup Basketball. 5 October 2018. Retrieved 13 October 2018. ^ "7DAYS EuroCup Round 2 MVP: Kenny Kadji, Tofas Bursa". EuroCup Basketball. 11 October 2018. Retrieved 13 October 2018. ^ "Round 3 co-MVPs: Raymar Morgan, UNICS and Giorgi Shermadini, Unicaja". EuroCup Basketball. 18 October 2018. Retrieved 18 October 2018. ^ "7DAYS EuroCup Round 4 MVP: Isaiah Miles, Limoges CSP". EuroCup Basketball. 25 October 2018. Retrieved 25 October 2018. ^ "7DAYS EuroCup Round 5 MVP: Luke Sikma, ALBA Berlin". EuroCup Basketball. 1 November 2018. Retrieved 1 November 2018. ^ "7DAYS EuroCup Regular Season Round 6 MVP: Erik Murphy, Fraport Skyliners Frankfurt". EuroCup Basketball. 8 November 2018. Retrieved 10 November 2018. ^ "Round 7 co-MVPs: Sammy Mejia, Tofas and Landing Sane, Mornar". EuroCup Basketball. 15 November 2015. Retrieved 15 November 2018. ^ "Round 8 MVP: Justin Cobbs, Cedevita Zagreb". EuroCup Basketball. 22 November 2018. Retrieved 25 November 2018. ^ "Round 9 MVP: Rok Stipcevic, Rytas Vilnius". EuroCup Basketball. 13 December 2018. Retrieved 20 December 2018. ^ "Round 10 MVP: Patrick Miller, ratiopharm Ulm". EuroCup Basketball. 20 December 2018. Retrieved 20 December 2018. ^ "Top 16 Round 1 MVP: Andrew Albicy, MoraBanc Andorra". EuroCup Basketball. 4 January 2019. Retrieved 6 January 2019. ^ "Top 16 Round 2 MVP: Jamel McLean, Lokomotiv Kuban Krasnodar". EuroCup Basketball. 10 January 2019. Retrieved 23 January 2019. ^ "Top 16 Round 3 MVP: Luke Sikma, ALBA Berlin". EuroCup Basketball. 17 January 2019. Retrieved 23 January 2019. ^ "Top 16, Round 4 MVP: Bojan Dubljevic, Valencia Basket". EuroCup Basketball. 24 January 2019. Retrieved 24 January 2019. ^ "Top 16 Round 5 MVP: Artsiom Parakhouski, Rytas Vilnius". EuroCup Basketball. 31 January 2019. Retrieved 31 January 2019. ^ "Top 16 Round 6 MVP: Dragan Apic, Lokomotiv Kuban Krasnodar". EuroCup Basketball. 7 February 2019. Retrieved 7 February 2019. ^ "Quarterfinals Game 1, MVP: Errick McCollum, UNICS Kazan". EuroCup Basketball. 6 March 2019. Retrieved 8 March 2019. ^ "Quarterfinals Game 2 tri-MVPs: Ennis, Giedraitis, Kulagin". EuroCup Basketball. 9 March 2019. Retrieved 14 March 2019. ^ "Quarterfinals Game 3, MVP: Peyton Siva, ALBA Berlin". EuroCup Basketball. 14 March 2019. Retrieved 16 March 2019. ^ "Semifinals Game 1, MVP: Peyton Siva, ALBA Berlin". EuroCup Basketball. 20 March 2019. Retrieved 23 March 2019. ^ "Semifinals Game 2 MVP: Sam Van Rossom, Valencia Basket". EuroCup Basketball. 23 March 2019. Retrieved 28 March 2019. ^ "Finals Game 1 MVP: Will Thomas, Valencia Basket". EuroCup Basketball. 10 April 2019. Retrieved 12 April 2019. ^ "Finals Game 2 MVP: Luke Sikma, ALBA Berlin". EuroCup Basketball. 13 April 2019. Retrieved 13 April 2019. ^ "Finals, Game 3 MVP: Bojan Dubljevic, Valencia Basket". EuroCup Basketball. 16 April 2019. Retrieved 18 April 2019. This page was last edited on 25 April 2019, at 11:15 (UTC).